It is been two months since Samsung had released fourth generation Tizen smartphone Samsung Z4. Now after the small gap they have released new performance update for it. It will bring some stability to the device and improvements in performance. This update is based on same Tizen 3.0 version, which introduced on this device at the beginning of its release. 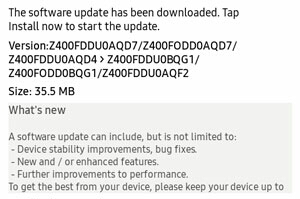 The update is 35.5 MB in size and the firmware name is BQG1/Z400FDDU0BQG1, the second upgrade by the company. New version haven’t brought any new features along with it though it carries system improvements and other bug fixes that are necessary for better user experience. Such software Tizen Update had always come to Samsung Z2 and Samsung Z3 in the last year. Those are now old devices compared to Z4 and no one knows when company will release new updates for them. Samsung Z4 is fast and reliable phone than its last models. It comes with 64-bit quad-core 1.5GHz chipset and 1GB RAM. In the camera department it shines with 5MP front flash camera and same 5MP back camera. The phone is 4.5″ with 2.5D glass and 480×800 pixel resolution. For the storage it has 8GB internal storage and can upgradable up to 128GB via external micro-SD card. The Samsung Z4 is now available in India and recently launched in South Africa for R1299. To update Samsung Z4 go to About Phone – Update – Software Update in Setting option and get latest version. The other way to download firmware is from computer using Samsung Kies software. You can choose any of these steps to install new update.